Trip: South Sister - North Face of Northwest Ridge (NFNWR) Trip Date: 06/26/2011 Trip Report: David Byrne, Tim Scott and I (Derek Castonguay) climbed this route on June 26th, 2011. It was really David's idea. He stated he had wanted to check out this line ever since he first noticed it in 2008. The Three Sisters Wilderness is a beautiful area and offers some great alpine adventuring. Seeing ScaredSilly's recent TR brought back some great memories and even stoked the fire to consider some other off-the-beaten-track routes. Oregon High - A Climbing Guide by Jeff Thomas is a great resource for climbing in this area. It is out of print, but covers the Oregon Cascades quite well. At the time we wondered if anyone had climbed that route before, but really didn't think about it too long. That's probably why we didn't take the time to come up with a cool name. We described it as a route on the North Face of the Northwest Ridge (NFNWR). Yup, a mouthful. I haven't been back down there in a long time and looking back at some of the pics from our trip, I am curious how the snowpack and route conditions would compare. We were out there in late June! With that said, our trip plan was very specific to put us in position to climb when the face was frozen. Climbing Hood door to door without an intentional bivy is not too bad because Hood is not too far from PDX and the approaches aren't that bad. Well, I suppose all except Cathedral Ridge... That will have to wait for another time. Anyhow, we chose to hike in from Pole Creek TH, which is over 3 hours from PDX. Considering the drive and hiking in from the north we decided to bring light bivy gear and hike in on Saturday. We chose to bivy near the Hayden Glacier camp commonly used for Middle Sister, etc. This allowed for a casual drive to the TH and hike into camp on a beautiful afternoon. We lounged around for a bit, soaked in some sun and got a few hours of rest. Our trip plan was reliant on a couple variables. We needed a solid freeze and we needed to be able to navigate over a large area just to get to the north face of South Sister. Conditions were perfect. We had cold, clear skies and a bright moon was out all night. This allowed us to leave camp around 11pm Saturday evening, hike over without too much hassle, climb a well frozen route and summit by sunrise Sunday morning! We descended the North Ridge, grabbed camp and hiked out in the morning hours before the snow got too soft. The timing, positioning and conditions were all in-line for a successful trip. I forget where we stopped for a burger and beer, but still got back to PDX at a decent hour. Conditions on route were very good for us. We climbed as a team of 3 on a single rope stretched out. The route starts with steepening snow leading up to the cliff band and climbing through the notch would be the most technical portion. David lead the way and we simul-climbed with intermediate pro I think in just one long block all the way to the summit. I think it might be about 1000'. We used pickets, ice screws and a few pieces of rock gear. ScaredSilly describes gaining the upper portion of the Northwest Ridge, but we had great conditions are were able to stay on the north face and climb directly to the summit. I do remember it was cold and windy on the summit. Twilight was just beginning, providing a dramatic scene. We stayed stretched out on the rope for the initial part of the descent because it involves some down scrambling and decided to utilize a simul-climb with intermediate protection until through this section. Starting from the Pole Creek TH does require the team to cover a lot of ground, but with good conditions and breaking it up with a bivy felt relatively casual. Reading ScaredSilly's recent TR describes a different approach and is a good example of versatility in the Three Sisters Wilderness. I don't want to flood this TR with too many pics, but I can always add a few more later on. Unfortunately, I do not have pics from the route because we climbed through the night and although the moon was bright enough for us to navigate, not bright enough for pics. I will initially post beta pics to orient and a few gps overlays on Google Earth. Who knows if anyone has climbed this route before, but it does not seem to be outlined or described anywhere. I did put together a brief description of this route to answer someone's inquiry on FB last year. I was pleasantly surprised to see others like ScaredSilly exploring this region and I am happy to add a description of our experience. Reminiscing on this trip and chatting with David briefly certainly rekindled the stoke for this region and I think he has a few other ideas brewing. However, may have to wait until next year... Here are some pics. And yes, pg 109 in Oregon High us useful to orient. Gear Notes: Pickets, Screws, Light Rock Rack, 2 Tools. Approach Notes: Pole Creek TH - Bivied near the Hayden Glacier camp. Right on! Looked like a good day out! Sent you a message. Edit: I will write up a TR! The Three Sisters Wilderness offers great adventures! It is awesome to see others exploring this area! Date of our climb was June 26, 2011. We simply referred to the route descriptively as North Face of Northwest Ridge (NFNWR). Oregon High - A Climbing Guide by Jeff Thomas is a great resource for climbing in this area. -and yes, page 109 has the best detail for the north side routes. This pic is looking over towards South Sister from camp. 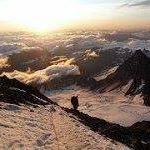 Trip: Mount Hood - Dreadful Goat - Castle Crags Date: 5/13/2016 Trip Report: I first noticed this line during the 2014/15 climbing season and actually went back scouting and attempting it several times over several weeks to no avail. I am familiar with the Reid cirque and Hood in general and could not find any published information on this line. I was glad it came back in good condition this year and Chris and I were able to climb through it. (I'm glad Chris joined me on this trip because he had come out with me on an attempt last season as well) It was most certainly engaging from the approach slope all the way through to the exit. Now that we climbed through it and were able to track it, we could see how it related to the neighboring variations that have been outlined and published. I also sought the impressions and historical knowledge of this area and Hood itself from regional climbing veteran Wayne Wallace and author of Oregon High Jeff Thomas. It is true, that there are published variations of Castle Crags and our top-out and exit overlap with 2 routes. I was aware of this. This area had been explored quite a bit in the past. The Dreadful Goat variation is a steep ice gully that offers access to the upper slopes and ridge crest from the Reid glacier. It is significant enough of a variation to be outlined. You will recognize the line clearly in Oregon High, MT Hood Climbers guide and various internet sites, but not identified. This TR is to share our experience of what was a great alpine adventure not too far from home. Expect 2 pitches of steep alpine ice leading to steep snow. This line takes you directly to the base of a rimed headwall and traverses left in hopes of finding suitable access to the ridge crest itself. The terrain is steep. Access to the ridge crest included impossibly steep snow transitioning to rime. Once topped out and assessed the conditions. Decided to re-rig an old piton, reinforce tat and rappel back down. We then continued to traverse left for a couple more rope lengths and an exit just beyond the towers. Dreadful Goat variation - Castle Crags AI4, Steep Snow, Rime Ice 1000' (9300' - 10200'(ridge crest) 10300'(exit). Some pics. Dreadful Goat variation is on the right with the Reid HW and other Castle Crags entrance gullies left and center. Couldn't rotate it. Oops. Have a few more pics, but gotta rotate them proper first. Sorry, no pics of the crest. Focused on how to rig a secure rappel. Gear Notes: 2 tools, ice screws, pickets, pitons, extra webbing, maybe a light alpine rock rack if more rock exposed on the ridge. Approach Notes: From Illuminatiion Saddle drop down onto the Reid glacier. Once you round the lower buttress of the Castle Crags formation you will see it if it is in. HHinkkala, Great to meet you guys on our local alpine playground this past weekend. It was a great day to be out. Just for clarity, I'm Derek and my climbing partner is Jonathan, also who is the author of this post. Oh yeah, congrats on Coflax! It is high on my list. Thanks for posting, tbrugh. bonathanjarret and I were the other party. Here are a few pics of the constriction, and the snow field above, leading to the West Ridge. We solo'd to the ice step at the start of the constriction and hoped to pitch it out in 60m, but didn't quite make it. We swung a quick lead to get into the upper snow field and simul'd up to the notch. All I have is pics of the SGC, but as you said, the upper West Ridge was mostly dry. That slab and off-width was interesting to say the least. Deep wet snow on the descent, meandering deproach of Mountaineer's creek and fun log crossing to complete the day. Good work Avalanche Lilly! Spark it up! i am also planning on heading out to olympus over labor day weekend, but the weather is not exactly favorable at this point. just cold and wet and cloudy i suppose. it does seem like crystal pass and the moat are the uncertain points, let alone being socked in by clouds if NOAA is right.